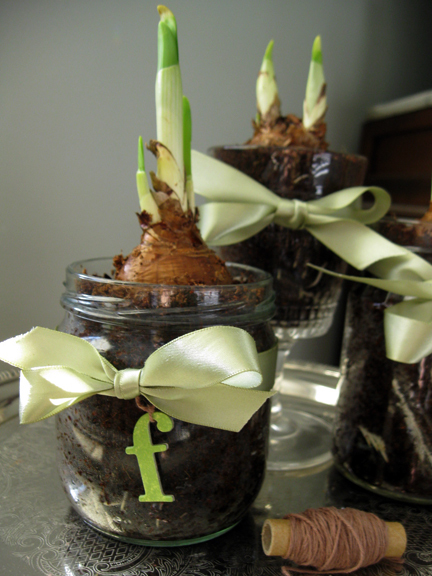 Have you ever planted a Paperwhite bulb? And then watched it grow from an ugly little orb into a brilliant white blossom? It’s quite an amazing experience. The sweet scent of these darling little star-like blossoms is intoxicating to say the least. They lift my spirits and make me smile just when I seem to find myself smack dab in the middle of the winter blues. It’s quite a treat to have something inside that’s alive…actually growing and blooming while everything else outside is hibernating beneath the snow and ice. It reminds me that I’m alive and that I need to grow and bloom as well. Sometimes, mid-January I just want to wrap myself in a big warm blanket and stay there until I can hear the sweet chirping of the birds outside my window. Do you ever feel like that? It’s not only medicinal, but it’s inexpensive, fun and really couldn’t be any easier to do. And what a perfect gift to give that hostess who has so graciously invited you into her home. She’ll be sure to be smitten after receiving this sweet sentiment! 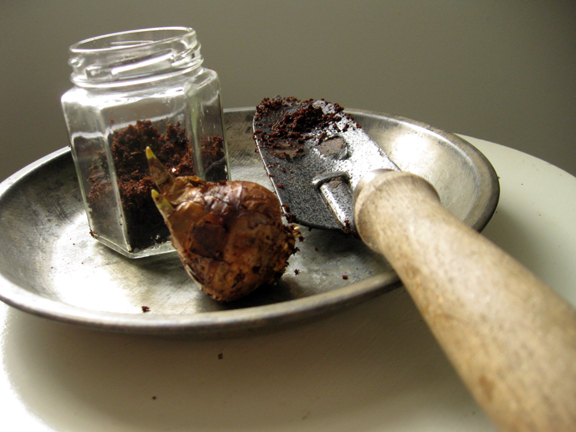 This is all you’ll need- some soil, a small container and of course a Paperwhite bulb. I like to reuse jars that I already have on hand. This jar happens to be a jelly jar. Isn’t it dear? Just fill the jar about 3/4 full with soil and place the bulb on top pointed side up. 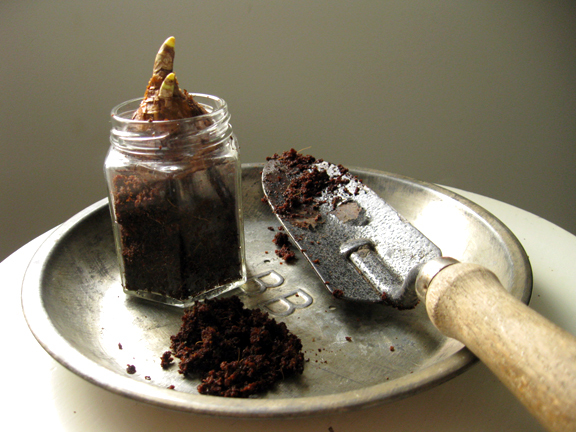 Make sure to have room to sprinkle some more soil around the edges but allow for about 1/4 of the bulb to be exposed. Keep the soil moist but not wet and leave the container in a cool place away from direct sunlight for about two weeks until the roots have grown. Once the bulb is well rooted and the shoots begin to grow move the container into a bright room- next to a sunny window is best. 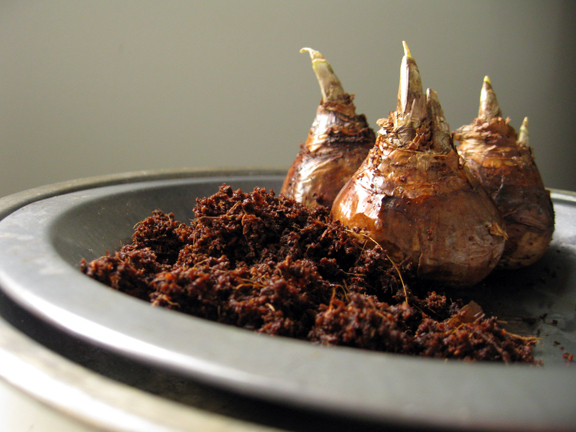 The bulb will usually flower about 3 weeks after planting. I enjoy planting more than just one and thought that a grouping of 3 on a silver platter would make a stunning specimen! Especially after I embellished my jam & jelly jars with matching ribbons. I mean who wouldn’t just smile as you walked past this darling little trio? Don’t you agree that one of these precious plantings would be just perfect as a gift? And even more perfect as a hostess gift? I like to make my hostess gifts personal by tying on sweet little cardboard letters that coincide with the hostess’ name. 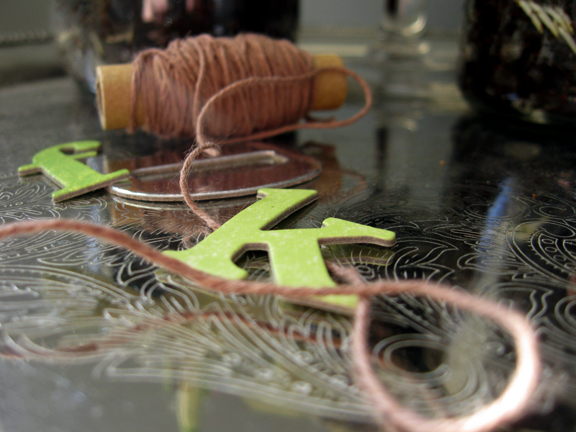 You can find these letters in any craft store or you could make your own. Instant personalization. And as easy as pie (or a Paperwhite in this case). As the stems grow make sure that you occasionally give them a turn to keep the stems from leaning too much towards the light. It may be necessary to support the stems with a small bamboo stick to help them from toppling over. And then my friend, stick back and enjoy the show. So beautiful and thoughtful Wendy.. just gorgeous!!! These are adorable. I love reusing jars, too. My husband is always asking me, “Really, you want to save another jar?” YES! 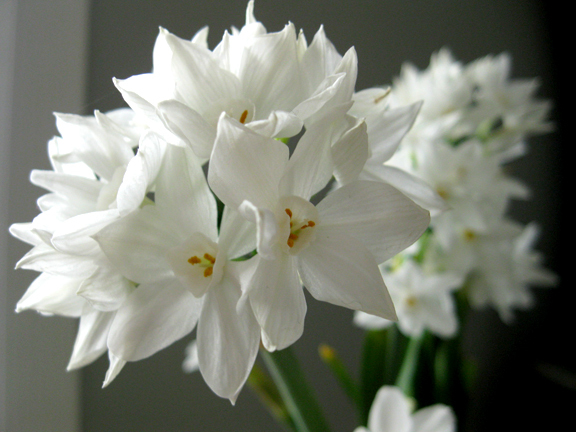 We are soul sisters in this regard; a winter without my Paperwhites just would not be the same. The only thing I would add? Take the time to buy some good bulbs from a garden center and don’t be suckered into one of those already prepared kits available. The quality of the bulbs in those kits are so inferior you will not get anything close to the results Wendy has shown us if you use them. I buy enough to do them in stages so I have a container of them constantly blooming throughout the winter; it’s my gardenaholic genetic makeup that HAS to have something I’ve planted in bloom I guess! Good point Barbara! The quality of the bulb really does make a big difference! And I LOVE the idea of planting them in stages! Brilliant suggestion! These are lovely, I’m searching for bulbs on the internet now and everyone is sold out. Wondering if they are easy to find at home improvement stores? A home improvement store is a fabulous idea! You could also try your local garden center or nursery! Good luck! I hope that you can find some! Love these! So gorgeous. I always seem to forget about flowers during the winter. These are absolutely gorgeous, Wendy. 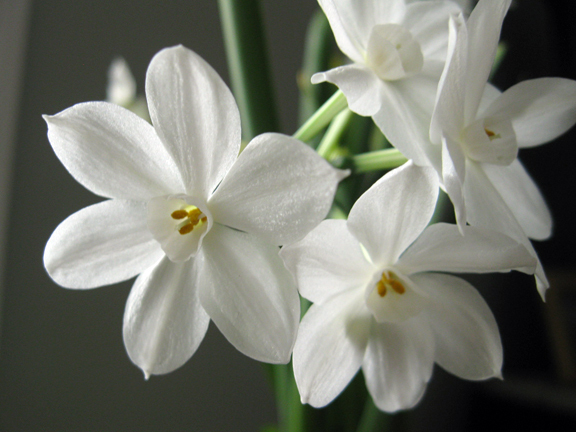 I have paperwhites right now on my kitchen table and they smell wonderful. I really should think about getting more for other rooms in my house too. What a fabulous idea! 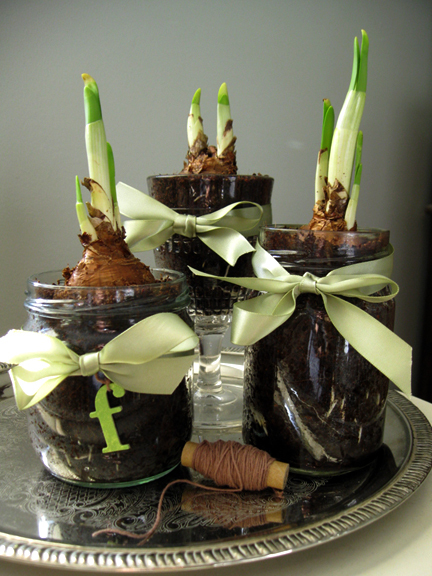 I love the recycled jars and paper whites are one of my favorite flowers. 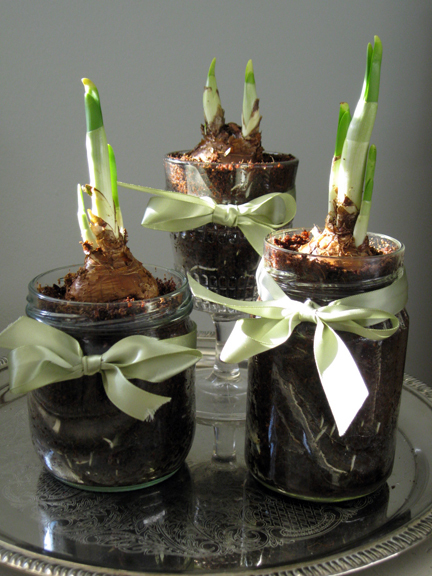 kindred spirits Wendy – i have 4 pots of paperwhites growing right now and they make me smile every time i see them!! This sounds like a wonderful idea, Wendy! I have plenty of mason jars from canning and I definitely want to give this a try! I got these as a Mother’s Day gift one year and loved them. I love how you personalized these. So beautiful! 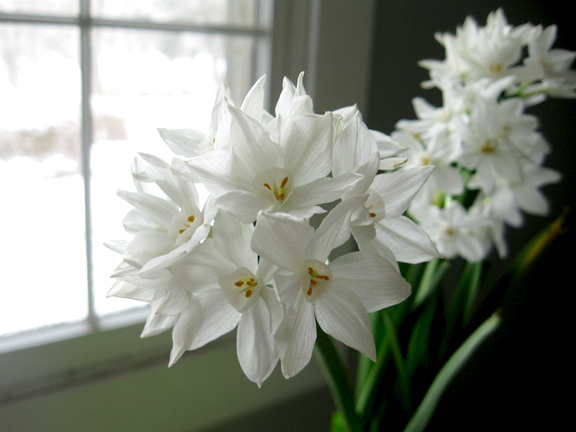 My mom often had paperwhites at the house… They make a lovely gift and definitely brighten up the house in the winter! Paperwhites always make me smile. Sitting prettily on my windowsill, they are a little piece of spring in the dark days of winter. Great idea for a post! OH yay! The aroma is wafting thru the computer screen. One year for hostess and teacher gifts, I bought the clear plastic/acrylic plant saucers, bulbs and large and small clear cellophane baggies. I then went down to Lake Michigan (lucky me its only a block away) and collected small smooth stones. I put 5 bulbs in one bag, the stones in another, placed them in the saucer and all into the large bag. Then typed up cards with “planting instructions” and tied it all together with raffia. The roots grow down in the rocks and it looks so neat and organic. BTWs…I received lots of invitations the next year…um? Paperwhites have special meaning in our house because my husband bought me a pack of bulbs the first Christmas we were together. In Sunny Southern California, we planted them outside, and about this time every year, they pop up and fill the yard. BEAUTIFUL! Maybe I ought to take a few and bring them inside to spread the love! You are so crafty and creative – so lovely, Wendy! Great idea to bring a little Spring inside! Oh, I just love this!!! What a fabulous idea!!! Those are so beautiful! I don’t think I have ever seen them before. I will certainly have to look into getting some! Thanks, Wenderly! I saw these on Pinterest and am making them for the ladies in my family for Christmas! Love em! ive tried this and the soil becomes very smelly….your comment? You may be watering it too much if the soil is becoming smelly. Can not wait to do this for the women in my life. THANK YOU! So so cute!